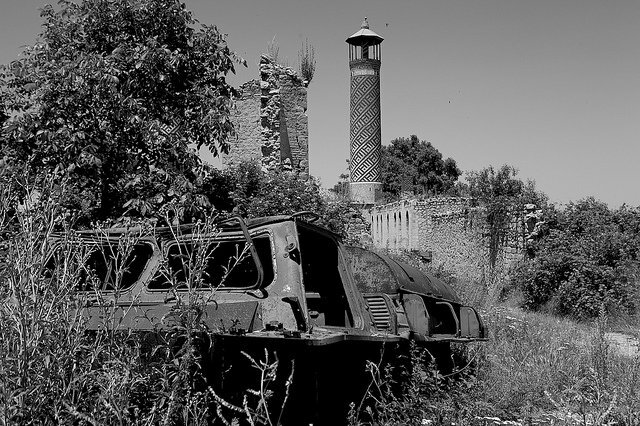 When war in Nagorno-Karabakh flares up again, researchers, reporters, and journalists need to be careful not to feed either side’s propaganda machine. But this is easier said than done. A recent outbreak of fighting has once again brought world attention to bear on the conflict over Nagorno-Karabakh, an unresolved territorial dispute involving Armenia and Azerbaijan in the south Caucasus. Since 2 April, dozens have been killed and many more seriously wounded. Thankfully much of the fighting has subsided while the sides return to a nominal ceasefire. While media attention is warranted and necessary, it does raise ethical questions about how journalists and researchers cover the conflict. Every time we tweet, retweet, write a blog post, or publish an article about the Nagorno-Karabakh conflict, we become unwilling combatants in a decades long war that, if we’re being honest, we know very little about. Shusha, Nagorno-Karabakh region, captured by Armenian forces in 1992. Photo CC: Michele Finotto / Flickr. Some rights reserved. The so-called “frozen conflict” (a misnomer) is less about the contested territory that spawned it, and more about deflecting attention away from two illiberal regimes that have grown disparagingly repressive and inattentive to the needs of their peoples. Though media attention tends to fixate on the conflict whenever violence reaches a crescendo, minor skirmishes along the line of contact are frequent. But violence does not come as a result of enemy fire alone. Conditions along the front are miserable, non-battlefield related deaths as a result of maltreatment and suicide are an unfortunately common occurrence. In fact, 2015 was one of the deadliest years of the conflict since the ceasefire was declared in 1994. As the conflict goes on without a resolution, both sides have increasingly taken to social media in order to galvanize international and domestic support for their side. In this sense, the attention we give the conflict often ends up boosting these regimes’ efforts to one-up each other in the world of social media and world opinion. Meaningful details about the conditions on the front -- or developments leading to its resolution – are often lost in the process. Both the Azerbaijani and Armenian governments have spent enormous sums on building up their armed forces, while their economies have weakened. Azerbaijan has squandered more than $20 billion on defence spending over the last decade. By some accounts, its annual spending is greater than Armenia’s entire state budget. Meanwhile, Armenia has been forced to accept Russian military assistance and military bases on its territory in order to keep up with their neighbour, in the vain hope that it can deter Baku. Each side is locked into a dangerous and illusory game that spending more, or acquiring the latest technology, will give them the edge over the other. It won’t. 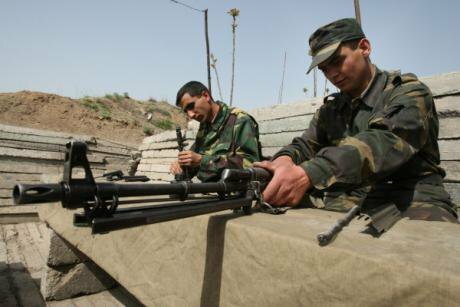 Soldiers of the Nagorno-Karabakh Defence Army clean their weapons in a trench on the ”line of contact”. Photo: (c) Ilya Pitalev / visual RIAN. All rights reserved.The corollary to this misbelief in the power of technology to bring ultimate victory is that any time something happens on the front line, one side or the other tries to prove its technological advantage by sheepishly parading their war-prizes in front of state media and other foghorns of the regime. Suddenly – what matters on the front is not soldiers’ conditions (which are deplorable), the useless and constant waste of human life, or the 1984-esque endless nature of the conflict – but that a helicopter was shot down, a drone was captured, that this many tanks were destroyed, that many casualties inflicted. Endless body counts; tallies dutifully kept by the secretaries of war. In Nagorno-Karabakh, this particular type of Technowar (an all consuming belief in the power of technology to bring victory and a blind subservience to body counts which are often inflated to show progress towards that end) is blended with peculiar mix of hyper-active social media “watchers,” mostly living abroad (including myself), and local restrictions on freedom of press – including the jailing and violent beating of journalists. Lacking important details from the front, we reporters and researchers from afar end up becoming unwilling combatants in a war that pits body count vs body count, downed helicopter vs. downed helicopter, one-by-one. Day-by-day. We become the tally keepers. In a war that has no instigator, where determining who started what is a fruitless endeavor, where escalation is calculated to score political points, not to bring battlefield gains, each article ends up being used in a propaganda campaign waged by either side on the terrain of world opinion. The war has become the single most valuable and abundant source of fuel for each regime’s propaganda machine. Every night the local media keeps daily tallies from the front, or reports on some new weapon acquisition that will tilt the battlefield in their favour. The constant media barrage is meant to create a sense of national duty and patriotism, while deflecting attention from the issues that matter most to daily life – lack of access to good jobs, basic services, and a deteriorating economic situation that is going to get worse before it gets better. All the while, the soldiers who are sent to fight and die in the trenches are mostly neglected and the horrors they encounter there are unceremoniously swept under the rug. Even the relatively high number of non-combat deaths, including a deplorable rate of soldier suicides, becomes subjected to geopolitical manipulation in order to portray one side as somehow weaker than the other. State censored (read: controlled) press releases detail of the suicides and poor morale of the enemy, but rarely their own. The media barrage is matched by a near media blackout when it comes to access for investigative journalists – meaning we know very little about what actually happens on the front lines, other than what can be corroborated by both sides. All that’s left are technocratic details put out by state-officials that bear little resemblance to the actual contours of war. Perhaps this is one reason why researchers are so quick to turn to the “frozen conflict” narrative even though thousands have died fighting since the 1994 negotiated ceasefire. 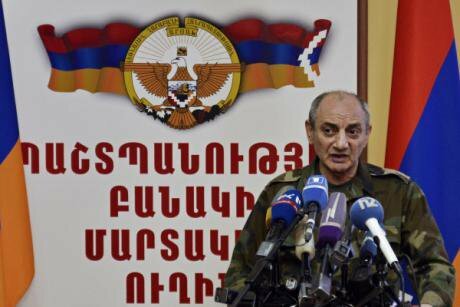 President of the self-declared Nagorno-Karabakh Republic Bako Sahakyan at a press conference on 7 April. Photo (c): Karo Sahakyan / visual RIAN. All rights reserved.We researchers, reporters, and journalists, need to be careful not to feed the propaganda machine. But this is easier said than done. When the conflict escalates in a logic of incessant one-upmanship, the temptation is to post our thoughts in rapid succession, and share what little information we have. However, because both sides keep information close to their chests, and deny access to journalists, the only thing that media outlets have to go on is opposing side’s propaganda. Otherwise starved of real details about the situation on the ground, the media thus develops a strange obsession with the types of helicopters (Mi24/35), or ThunderB drones, or tanks destroyed, or number of casualties. It is these very technical and abstract details that the logic of technowar depends on. Given the amount of misinformation and downright lies, most of our collective efforts end up acting as an echo chamber for the powers-that-be. It’s not helpful that it’s hard to denounce both sides equally in 140 characters or less – or that the #NKpeace hashtag (the one meant to be promoting resolution) can be so easily and unceremoniously taken over by propagandists on either side. The result is that even when we carefully avoid wading into the waters of misinformation, we none-the-less often reward propagandists and their surrogates. Well-meaning people get sucked into the lingua-franca of technowar and unknowingly drift into meaningless debates about minor details that say little about the root causes of the conflict or the reasons why it persists. We resign ourselves to its logic, without thoroughly investigating its contradictions. For example, the very mediators of the conflict are the ones who benefit the most from selling weapons to both sides. Mediators that are themselves deeply embroiled in their own geopolitical game of cat-and-mouse. We write academic papers on the nature of “frozen conflict”, but know little about frozen trenchfoot that soldiers endure. We can recite statistics endlessly, scrutinize the same maps over and over, but not much else. And this is exactly how both regimes, in Baku and in Yerevan, would prefer to keep it. A version of this article was originally published on the author’s blog The Accidental Geographer. We are grateful for permission to republish his work here.